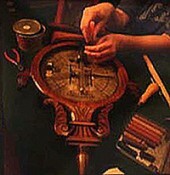 Russell Scientific Instruments offers a complete repair and restoration service for both old and new instruments. The company's skilled craftsmen can repair and refinish damaged wood and metal work. The company specialises in blowing new glass tubes for barometers, and also for thermometers. When possible broken or damaged parts are repaired. When this is impossible, replacement parts will be matched to the original parts as closely as possible. 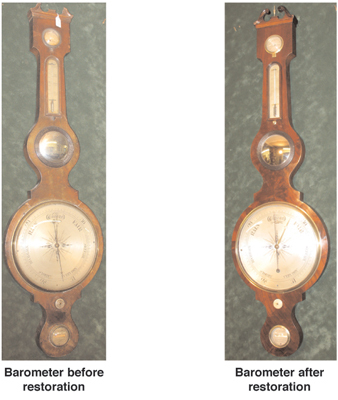 All barometers should be handled and moved with care although aneroid instruments are much less delicate. Great care must be taken if a mercury tube is broken as mercury is poisonous. Any mercury that is spilt should be recovered carefully and kept in a closed container. Advice is available should you experience any problems with, or need to dispose of, spilt mercury. For Repairs Please contact us. Don't forget to tell us where you are and send a picture of your barometer.